Harriet Bond Stenberg, 1931-Nov.11, 2018. Harriet was born in Honolulu, Hawaii and graduated from Vanderbilt University’s Peabody College of Education. Harriet first taught school in Hawaii in the late 1950’s and it was during this period of her young life that she first met her future husband, Carl Stenberg, Jr. through mutual friends. After teaching for a few years in Hawaii, she moved to California and began teaching in the Mountain View School District as a 4th grade elementary teacher. Shortly after she had settled in California, she was hosting a small party at her apartment and one of her friends suggested she invite Carl, since he was living in Sunnyvale at the time. The rest is history! Carl and Harriet were married in 1963 at the Los Altos United Methodist Church (LAUMC). During her time teaching, Harriet also managed the GATE program for a few years before returning to the classroom, where she taught for close to 35 years. Harriet was predeceased by her beloved husband Carl, to whom she was married for almost 46 years. She is survived by her son Carl Stenberg III and grandchildren Sarah and Andrew; her daughter Lara Vastano and son-in-law John Vastano and grandchildren Emily, Allison, Elizabeth and Alex; her sisters in law, Carol McPadden and Mary Jane Bond, and many nieces and nephews. Harriet had many interests and hobbies including reading, sewing, gardening and traveling. 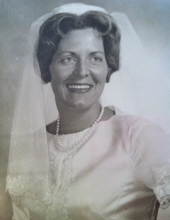 While she was actively involved in her children’s and grandchildren’s lives and very much enjoyed watching them grow, Harriet drew great strength and satisfaction in the years following Carl’s death from the love and support of her community at LAUMC, not only the pastors but also the UMW, bible study and reading groups and in the church office as a volunteer on Wednesday afternoons. Services were held Saturday, November 24th, 2pm, at the Los Altos United Methodist Church, 655 Magdalena Avenue. In lieu of flowers the family requests donations to the United Methodist Women group of the LAUMC. To plant a tree in memory of Harriet Bond Stenberg, please visit our Tribute Store. "Email Address" would like to share the life celebration of Harriet Bond Stenberg. Click on the "link" to go to share a favorite memory or leave a condolence message for the family.